Includes (3) Carbon Pre-filters & (1) 8 pound V.O.C. filter. This kit lasts for one year. Replace pre-filters every 4 months and V.O.C. filter yearly. A: I am sorry but I do not understand what you mean by height of filter? This product is the replacement filter kit for the 2500 unit and only fits this machine. 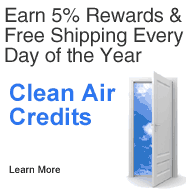 169 Clean Air Credits will be rewarded to you when you buy this item.